From the Canyon Edge: Have you taken Lucid for a testdrive yet? Ubuntu Lucid Lynx is in Feature Freeze, and Alpha3 is right around the corner, releasing next week. 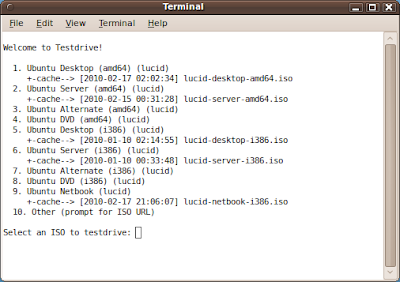 If you're running Ubuntu 9.04, 9.10, or 10.04, it's trivial to testdrive Lucid in a virtual machine, without modifying your current installation! If you're already running Lucid, congrads! 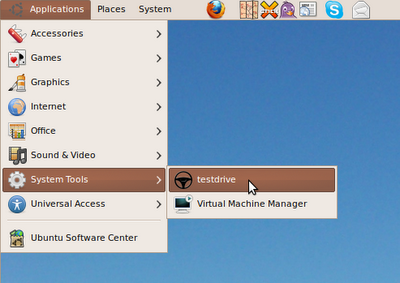 All you need to do is add the testdrive ppa, and install testdrive, and either kvm or virtualbox-ose. Then you can either run testdrive from the command line, or use the menu, Applications -> System Tools -> Testdrive. Then, a menu will pop up, with a menu of Lucid daily images. If you have previously downloaded any of these, you should see a timestamp of the cached file. If you run testdrive everyday, your cache will stay up-to-date, and the incremental download will be much faster! Select one of the offered ISOs, or enter a URL to another one of your choosing, and you should be off and running. Help us make Lucid Lynx the best Ubuntu to date! Nice. It would be nice if a graphical interface was added instead of the text menu in the terminal window. 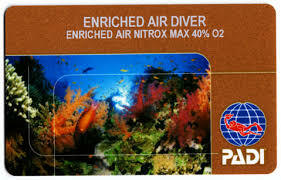 its great and helps a-lot, and i wish that it could work for me. the problems isn't in test drive (i think) because it installed lucid and ran it on VirtualBox, then i chose "Run Ubuntu without Installing", then i have that amazing black screen with nothing but White Underscore blinking. i left it for an hour but nothing changes. This problem didn't happen on Lucid Alpha 1 but now i have this problem. I tried this out and the tool very helpfully pointed out that I didn't have VT support and so things would be slower than the might otherwise be. Of course, I do have VT support, I'd just forgotten that you have to turn it on in the BIOS. That should give my VMs a bit more oomph. You may want to fix the spelling of the title of this post, Dustin. This is my first time trying out Testdrive. It seems like a great idea. I've got this error and googling didn't produce any helpful results. Do you have any suggestions that I try? I'm using both VirtualBox and VMware on the box with VT extensions. The testdrive-gtk package is abandoned, as far as I'm aware. I don't see what the big deal is about wanting a GUI... You can launch testdrive from the Ubuntu Desktop, Applications->System Tools->Testdrive. You then interpret a simple menu and type a number to select an image. After that, a GUI pops up running either KVM or VirtualBox. I can't justify the effort of writing a testdrive-gtk front end. But if someone else wants to do so, I'll gladly provide a stable API to the command line back end. 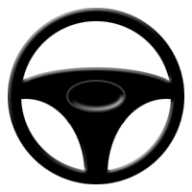 I suggest that testdrive-gtk be it's own package/project, though, as I don't have any desire to work on it. It would be nice to add an option tu use an already downloaded ISO (using last option and "file:/path/to.iso" doesn't work). 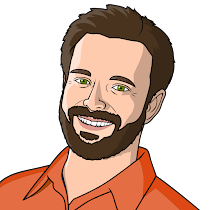 A simple workaround is using Python's SimpleHTTPServer. See the manpage. You most certainly can use local paths. file:///path/to/foo.iso. Trying testdrive but seem to have a problem with rsync. Probably have to check the firewall to see if that is casing the problem.